*Photograph credit to Stars on Canvas / Willow photographer – My picture was displayed on the right, second one in from bottom – you’ll need your glasses, but a nice to get a feel of it’s position in the gallery!! Well, another event under my belt, pleased to say that my efforts this year raised £92 towards the Willow Foundation, a very worthy charity which offers support for 16 – 40 year olds with life threatening illnesses. 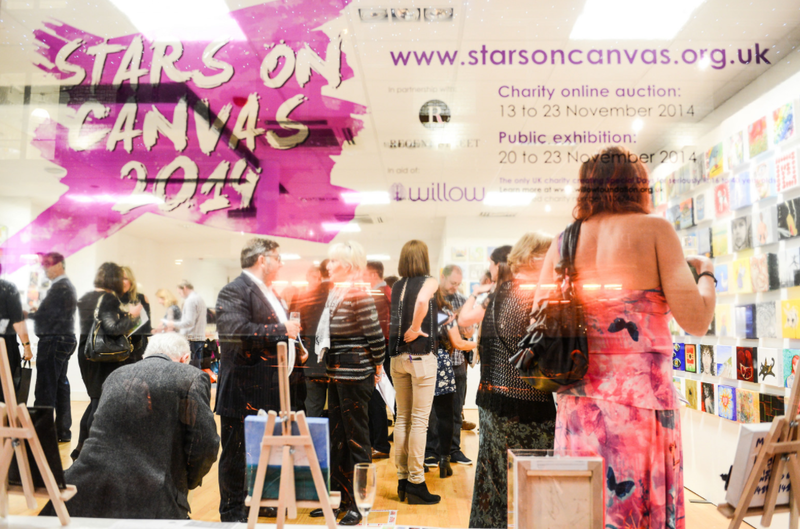 This event consists of canvases being painted, exhibited in London and sold by the charity via online auction on Ebay. Prices ranged from £30 – £5,000. You can view Willows official photos of the exhibition in London, click here. I participated in this event two years ago completely by chance, after contacting a very well established artist, Julieanne Gilburt, I took a deep breath, and contacted her about signatures, and my having been signing my work with our same initials. Somebody had mentioned it to me, did she mind?! She was utterly lovely, we had a long conversation and she offered a huge amount of advice and support. She finished by looking at my website and asking if I would like to include a canvas in a charity exhibition she was organising in a couple weeks time, I couldn’t believe it when I looked at the line up of artists who had included canvases, it was like a who’s who of the art, celebrity, and sport world. It was a bit short notice and I was willing the paint to dry, but we did get it shipped, painted and and hung in time. Next time, I thought to myself, I will get a canvas finished way ahead of time and avoid the last minute rush….. Or, so was the plan…..
Planning ahead, I took delivery of this years canvas months ago…. Always sitting there on my ‘to do list’ Ahhh no worries, I still have plenty of time to do that…. Before I knew it, the summer holidays had arrived, Herts Open Studios was in full flow, which led onto a lot of encaustic workshops in October, half term came and went, and suddenly the event was on the immediate horizon. The exhibition was a little earlier than I had remembered two years ago and with a panic, it dawned on me that I had ten days to finish it and get it in, exactly the same as two years ago!! 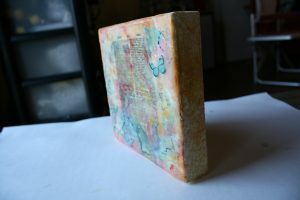 I considered not participating, as those ten days were already very full with other events, but I snatched a few minutes here and a few minutes there, determined to get an encaustic piece into the show, and finally hand delivered it the night before the auction went live! 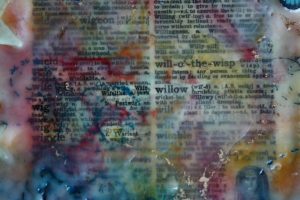 **(Raises eyebrows and shakes head at herself)** I couldn’t make it to the private view, but I am so pleased I did enter a piece, having recently received, an awesome ‘Thank You’ message from Willow…. Wow! It’s a lovely feeling to be a small part of something that makes such a big difference. To find out more about the Willow Foundation click here. Here is a link to my 2012 blog and you can find more about this years entry on my Facebook Page.